Today I’m putting the idea of really thinking more intentionally about my style into action and taking the time to style my shelves in a new way was definitely easier than I thought it would be. Who knew styled shelves could be so easy? The shelves in my family room have been bugging me for awhile. So much so that they totally distracted me during the final episodes of Parenthood that I had been waiting months for -thank you for finally pulling through Netflix! 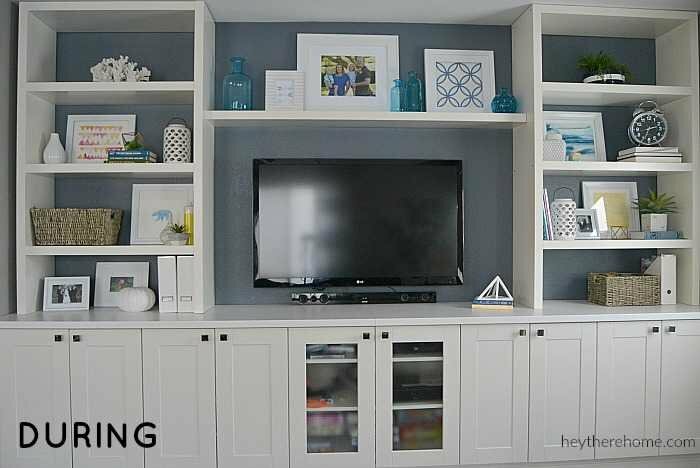 As you know I’ve been working on giving my family room a bit of a refresh and bringing in more color was one of my top priorities. So once I had my new rug down it set everything into action and I was able to add even more color and personality by adding art to the space. Yes, thanks to the lovely folks at Minted, I have art in my family room, not just photos of my cute kids. And it is making me feel really grown up AND helps define my style direction. Here’s what my shelves looked like until a few days ago. 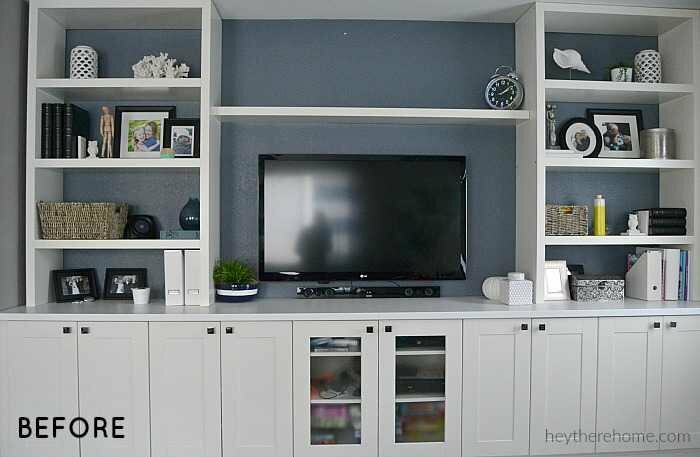 The problem with the styling on these shelves? Well besides the fact that they make me want to hit the snooze button, the main problem is that the bottom 2 shelves on either side had just become a place to put stuff that didn’t have another place to go, or that I hadn’t gotten to yet. I pretty much realized that although I liked almost everything on the selves, just sticking it on the shelf without giving it a way to shine was making it look like well, a bunch of crap on a shelf. 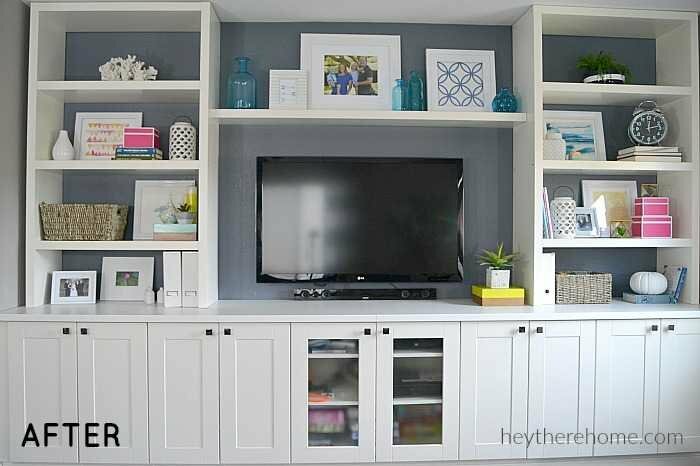 The other problem is that a lot of the darker stuff, like the picture frames were drowning against the dark blue wall, which I like because it helps mask the giant television. And the final problem is that I’ve been working hard to really be more intentional when it comes to my home decor style. I’ve keyed in on how I want this room to feel and that is organized, calm, and a little bit happy. These shelves don’t say any of those things. So once the Christmas decorations were down and packed away, I thought it would be a perfect opportunity to revamp these shelves. It was actually pretty fun! First, clear everything off of the shelves. Give them a good cleaning. Lord knows my top shelf needed it bad. Wipe down everything that was on your shelves too and lay it out on the floor or on a nearby table. 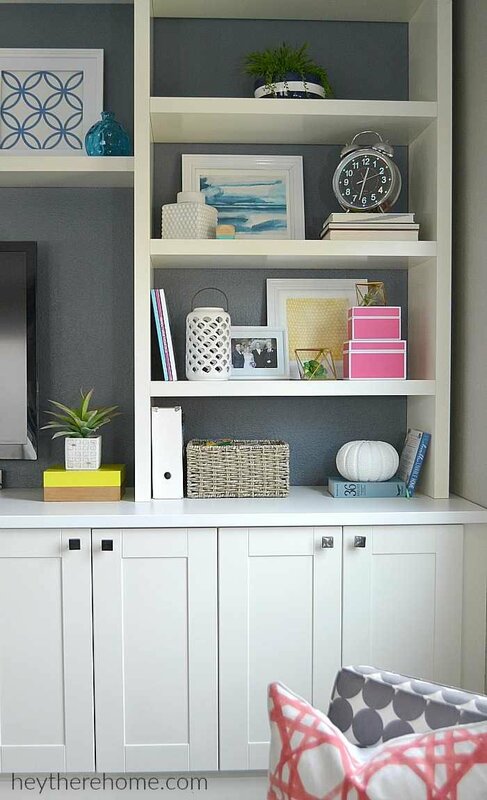 Now to keep it simple separate everything into 3 groups: Books and boxes, art and photos, and decorative items. In thinking about the new direction of my family room, I decided to switch out many of the family photos for art. This gave me the opportunity to add a lot more color, and to add personality in a different way. For so long I hesitated when it comes to buying art and relied on photos, but I’m really loving how the art lets the few family photos that I did display become more meaningful. Instead of going out and buying all new frames, I simply reused the black frames. A nice coat of (spray) primer followed by Rust-Oleum white spray paint in high gloss gave my frames a whole new life! So now everything is clean, and there is a new coat of paint on my frames and it is time to get my shelves put back together. I started by placing large items first. I placed the baskets first and then the books, stacking some and leaning some. 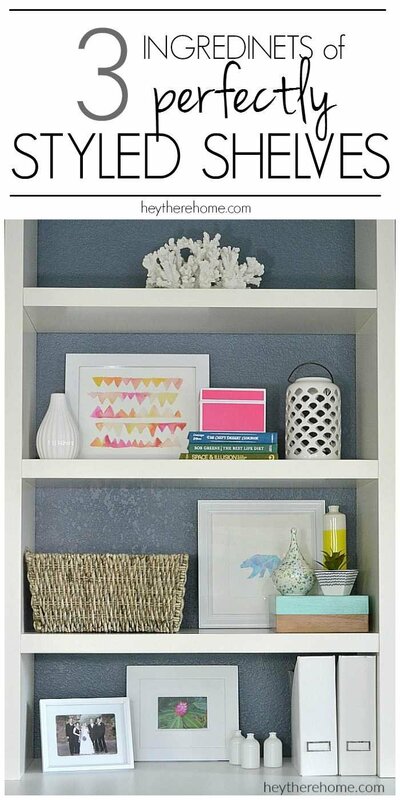 You will want to create some vertical and some horizontal lines to add interest to your shelves. Then I added the art. I leaned the art against the walls on the shelves sometimes behind and sometimes off to the sides of the items I already had on there. Don’t be afraid to have some of your art covered up. The layering will create a lot of depth and be more interesting in the end. Finally I added in my decorative objects. To continue adding depth and interest to each shelf, I made sure that I varied the height of the objects. Rather than put everything on the shelf itself, I put some objects on top of the stacks of books. This helps fill in some of the negative (empty) space. But be careful here. You want to leave some negative space so that you don’t created overfilled -dare I say cluttered shelves. My art was looking really good, and the shelf styling was certainly better than it had been, but there was still something missing. 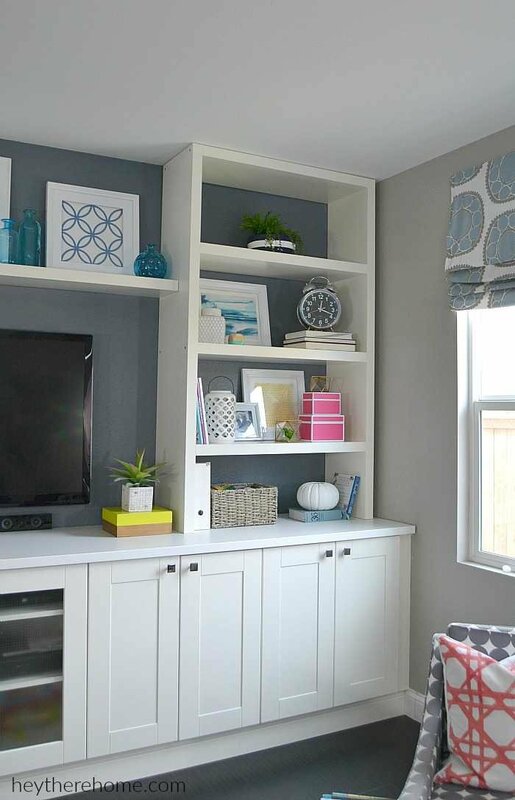 Originally this room was very monochromatic and had mostly blues and greys, but my goal was to take that calm vibe and add a little bit of happy to it with a few pops of color. The first step to getting outside of my comfort zone was to order art with some pinks and yellows in it to add those pops. Minted turned out to be the perfect resource because you can search by style and color. For those of you not familiar,Minted is an online marketplace connecting you with independent artists from all over the world. Once I had my art, I liked the direction it was headed, but there wasn’t quite enough. I needed to add a few more pops of bright color if I wanted to highlight the art and add in that pinch of fun. Knowing exactly what I needed at this stage made going out and finding those pops of color really easy. And the result is perfect! See how now your eye pops around the shelves more naturally because those few extra pops tell it where to go! 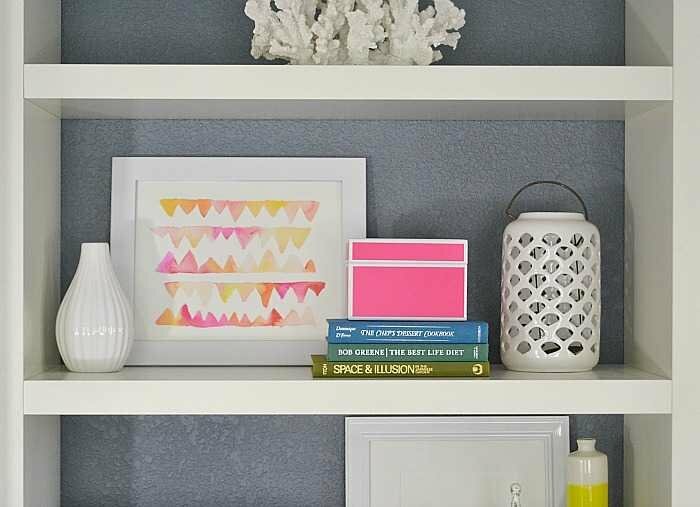 Just adding a pink decorative box really brings out the pink in this pink and yellow zig-zag print (and the bottle with a little yellow on it on the shelf below keeps your eye moving. I’m a proud Californian who loves geometrics and this California bear print hints to both of those things perfectly. In front of it (and off to the side just a bit,) I added 3 decorative pieces all made out of ceramic. By themselves, they get a bit lost against the white shelves, but placing them on top of a colorful decorative box fixed that. I kept the top and bottom shelf simple by keeping all of the objects white. On the other side of the TV, I added my main pop of yellow with this subtle triangle print and brought the pink over here as well with 2 more boxes. Again, I kept the top and bottom shelves on this side minimal too with no big pops of color, but I did add one more pop in right next to the TV. And for the sake of my new love of art and to leave you with a sneak peek of the final reveal of this family room refresh, I’ll give you a glimpse of this beautiful sunset painting that now hangs on the wall! Styled shelves aren’t something that come naturally to me. I’ve had to really work on it and I have to say that taking the time to play around with things to get just the right look and the right balance is paying off. Adding in the decorative objects is by far the hardest part. Here are a few tips to keep in mind. A lot of little things that don’t relate can look unintentional and cluttered. Instead, group smaller objects together by theme, color, or even size and it can instantly look like a collection. Groupings make the most sense to the eye in odds. Think 3’s and 5’s. 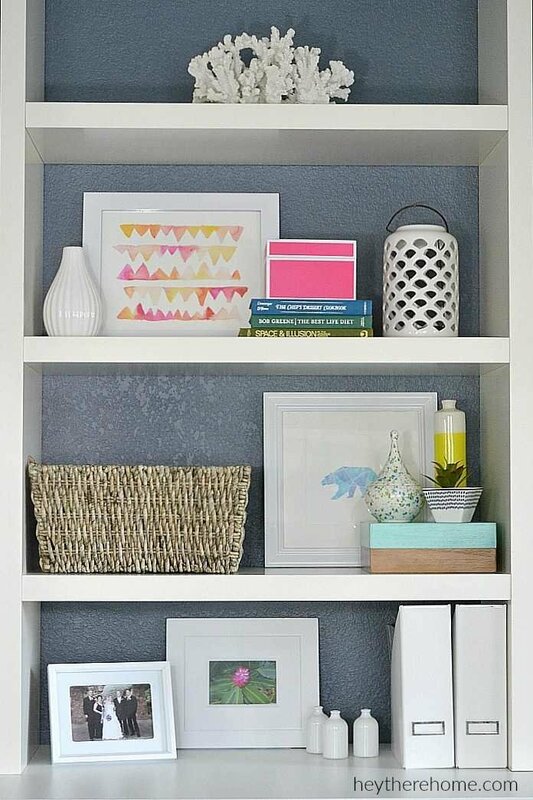 Keep most of the things on your shelves within the same 3 colors, then add in just a few pops of colors with some additional items. When adding in color, make sure you are paying attention to balance. For example on my shelves, the accent color is pink. I made sure that there were equal pops of pink on each side, and that they didn’t line up perfectly from one shelf to the next. This forces your eye to bounce around. If you found this post helpful, be sure to pin it for future reference and share with a friend! A big THANK YOU to Minted.com for sponsoring this post. All opinions are 100% my own and a product wouldn’t make it on here if I didn’t love it. What if you are looking for more of a minimalist style and don’t want much in the way of decorative objects. I want my home to look homey and lived in but without much in the way of “stuff” just for the sake of stuff. Style without stuff….is that possible? That is absolutely possible Barbara! If you’re styling shelves in a very minimal way you could do that by having more empty space, larger pieces that make a bigger impact, and/or keep the color palette very monochromatic or neutral so that things blend in with only a few pops of color or texture. Not every shelf has to be full. Some can have just one larger thing. I’m always a fan of doing what feels really good to you, if that means way less stuff, that’s what you should do. Hi, I recently found your blog through IG and I LOVE your style! I love color and the way you use it! I was wondering where your shelves and furniture is from? I would love this in my family room! Thanks and happy holidays! are the picture frames wood or plastic? Was it easy to get paint to adhere to them? Hi Polly. Some were wood and some were more of a plastic. The key is to use a primer (spray paint) first. Then it should be no problem. I spray paint a ton of things and if it is a really smooth surface, the primer makes it no problem at all. Looks so good, Corey! These are really great tips – I’ve been doing the same thing – trying to be really intentional when it comes to decorating. For so long I would buy something that “would work” and then I ended up tossing it in just a few months. When you are really intentional about it you end up with things that you love for a long time. And Minted has such pretty art work don’t they? Love what picked and your shelves look great! Thanks girl! I’m definitely loving the lighter look and I agree…it takes me longer to make a decision, but I end up with stuff I really love! I so hope you are doing well. Love that little Millie’s face! So stinkin’ cute! They really pop now! Great job.